Despite the high number of Uber and Lyft riders in the Seattle area — nearly a quarter of a million people — more than 80 percent of them own or lease a personal vehicle. Just how much do we rely on Uber and Lyft to get around the Seattle area? Consider this remarkable statistic: Nearly a quarter-million people here say they’ve used one of the ride-hailing services in the past week, according to new market-research data. Other than the bus, that’s more people than those who use any form of public transit. This data comes from market-research giant Nielsen, which provides us with the first local data showing who uses services like Uber and Lyft. The firm surveyed close to 3,000 people in the Seattle metro area from September 2016 to August 2017. Nielsen asked area residents what modes of transportation they’d used in the past seven days to get around for any purpose. According to the data, a projected 247,000 people — 8.3 percent of the adult population — used one of the app-based ride-hailing services. That ranks as the fourth-highest response to the question behind driving, taking the bus and carpooling. Light rail is slightly behind the Uber- and Lyft-like apps. Next come ferry, bicycle and train, in that order. And taxis — remember those? — they’re dead last. Only 2.4 percent of Seattle-area adults say they’ve used them in the past week. The ride-hailing apps beat them out with 3½ times more patrons. 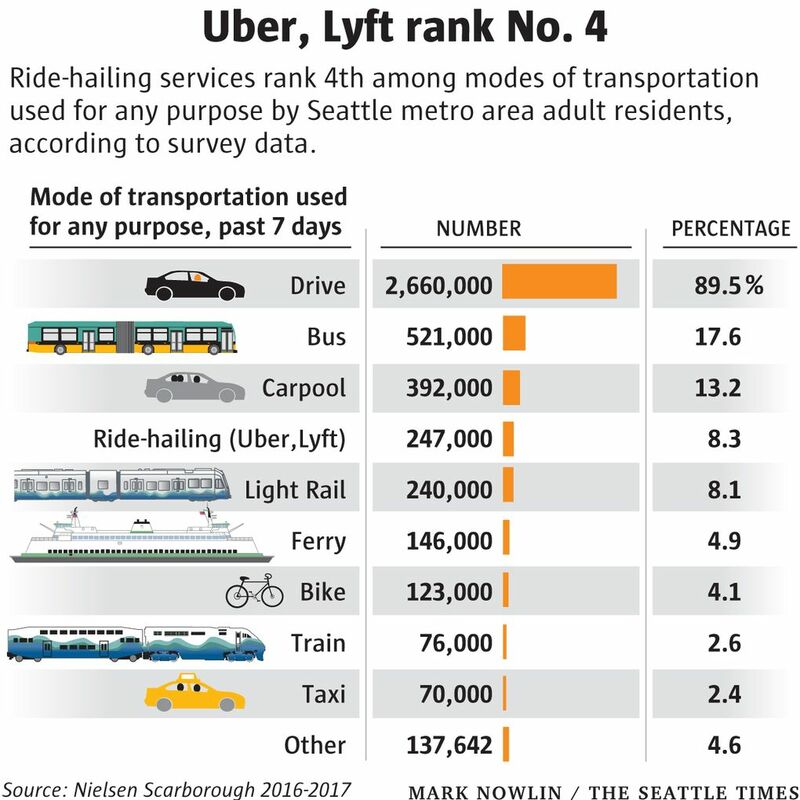 Seattle’s gap between ride-hailing services and taxis is one of the largest among big metro areas, but there are quite a few places where taxis fare even worse in the face of Uber and Lyft. In Dallas, Las Vegas and Denver, for example, about 1 percent of residents have taken a cab in the past week. Can you guess where taxis still have the upper hand? The last major holdout, with its iconic yellow cabs, is the Big Apple. Fourteen percent have used a taxi in the New York City area, compared with 8 percent for ride-hailing apps. In the Seattle area, another 138,000 people used some other form of transportation, like motorcycles and mopeds, plus the myriad new electricized options for getting around that you see on sidewalks — unicycles like Solowheel, skateboards and scooters. (Walking was not one of the choices to this question). The data reveal that people who use Uber and Lyft also embrace public transportation. Sixty-two percent of Seattle-area ride-hailers say they’ve also taken the bus, light rail or some other form of transit within the past week — that’s nearly three times higher than average for our metro. As popular as the ride-hailing services are here, there are places even more dependent on them. Among the 50 largest metro areas, Seattle ranks 13th. In the San Francisco Bay Area, which is No. 1, about 16 percent say they’d used the services in the past week — that’s nearly double the number for our area. Boston’s metro comes in second place, followed by Washington, D.C.
One thing to keep in mind about the data: The survey question captures the number of unique users of each mode of transportation — not the number of trips they took. People are, undoubtedly, much more likely to take transit for their daily commute than Uber or Lyft, which they might only use once or twice a week. And so, the number of trips is certainly higher for, say, light rail, than it is for ride-hailing services. Also, people were surveyed in our entire metro area, but light rail only runs within King County. Uber and Lyft are also available in Snohomish and Pierce counties. That said, use of Uber and Lyft is a lot higher in cities than it is in the suburbs. I looked at the numbers within the city of Seattle itself, and usage shoots up to 21 percent. In fact, half of all the ride-hailers in our metro area live in Seattle proper. 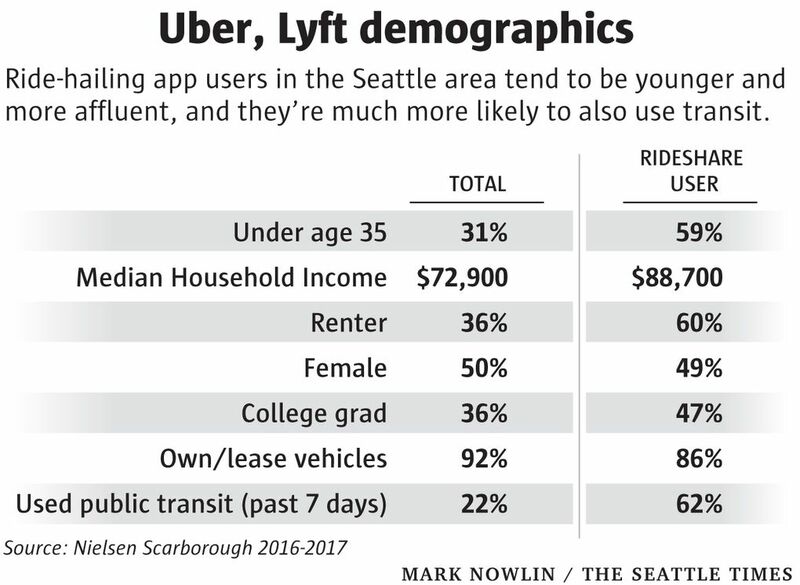 The data show that users of ride-hailing services in the Seattle area tend to be younger, with the solid majority under age 35, and they’re much more likely to be renters than homeowners. They’re affluent, too, with a household income about $16,000 higher than the median for our metro. Ride-hailers are split pretty evenly between men and women. People certainly don’t seem to be using the ride-hailing services as a substitute for car ownership. 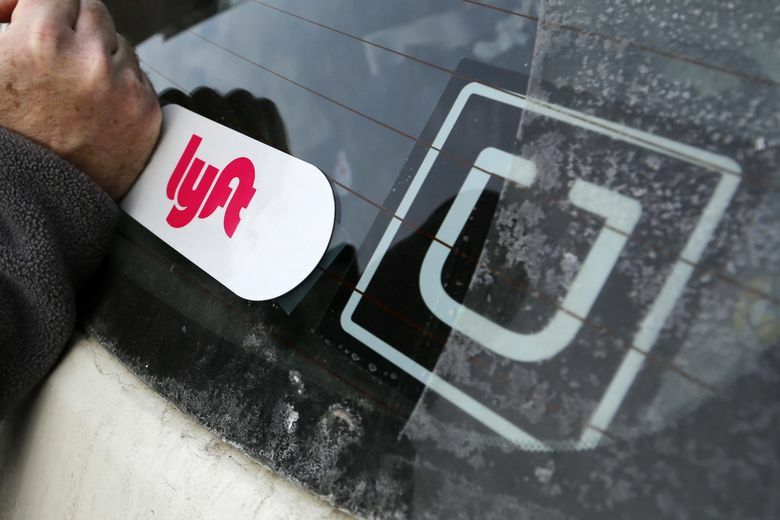 The data show that 86 percent of Uber/Lyft riders own or lease a vehicle, which is just a little lower than the metro average of 92 percent. Correction: An earlier version of this story included a graphic that misstated the percentage of ride-hailing users who own or lease a car as well as the total percentage of people in the metro area who own or lease a car.